I’m sure you are all familiar with the refrain we hear in art history books about the differences between the Renaissance in Northern Europe and Italy. Well, to put it mildly, the idea that the Italian Renaissance was somehow more fabulous than in Northern Europe is—pardon my language—hogwash. The awakening of Europe to a more prosperous and educated middle class, less controlling Roman church, and stronger secular monarchs and countries was Europe-wide, not just in Italy. So what if they didn’t have ancient Greek and Roman sculpture to study as anatomy examples? Northern European Renaissance art is a sort of intense, expressionistic realism that even amazed Italians. Look at the Portinari family in Italy! They couldn’t get enough of Rogier van der Weyden and Hugo van der Goes! And Antonello da Messina and Giovanni Bellini did more than take a cursory passing look at Northern painting. Anyone who looks at Romanesque and Gothic churches in Northern Europe can see that sculpture did not disappear during the Middle Ages after the collapse of the Roman Empire (ca. 500s CE). All over Europe, the spiritual overtook the physical in importance. That is not to say that Romanesque and Gothic sculptors were not somewhat influenced by classical sculpture. Just look at the jamb figures of some of the portals of Chartres Cathedral. As the Roman church lost its stranglehold on European countries, they evolved into nation-states with strong central governments. Art schools began to really flourish during the 1300s, and the “estate of humankind” began to be considered, rather than a worldly curse, a gift from God and something worth celebrating in art. The courtly styles of sculpture in Northern Europe radiated from Burgundy, Paris, and the princely courts in Germany. Freestanding sculpture, outside of churches, was rare, so it is not surprising that much of the Northern sculpture in the 1400s looks like jamb figures from cathedrals that stepped off their pedestals. That said, they have acquired an astounding quality of relaxed, fluid elegance and natural movement compared to jamb figures. 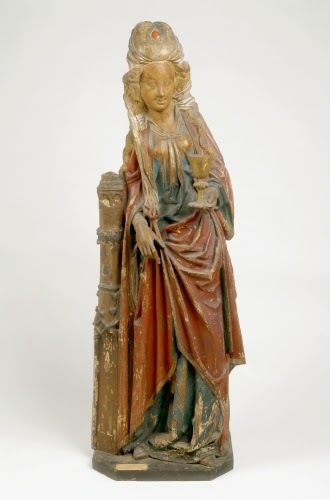 The proportions of the figure of Saint Barbara are right on, and the sculptor has even tamed the high forehead seen in Northern paintings of women, which was a symbol for intelligence / wisdom (a fashion thing when they were wearing big headgear). 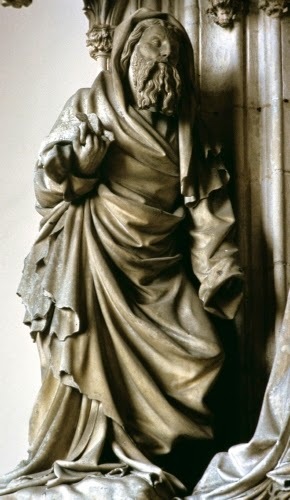 Speaking of big headgear, Saint Barbara sports a turban-like wimple (probably material stretched over a wire frame), which was the fad among young noble women. The drapery is treated in a style that was popular in both painting and sculpture called “Zackenstil” (jagged style) in Germany. It refers to the depiction of drapery as swirling, pointy-edged folds. The artist obviously studied folded material, just like Leonardo did, by draping wet material for study purposes. While the drapery doesn’t technically reveal the body underneath, it is very convincingly part of a human figure. I will point out two aspects of this work that make it more “classically” conceived than most Italian sculpture of the same period: 1) The sculpture is painted, and we know that Greeks and Romans painted their sculpture; and 2) Is that a pew/fencepost/harp that supports the figure? Gee, sort of like the omnipresent tree stump supports in Roman copies of Greek sculpture! Two other Northern sculpture masters: Claus Sluter’s work is phenomenal, with hints of a body underneath the massive drapery, and Tilman Riemenschneider is a poster-child for Zackenstil.